Money for the building was slowly but surely coming in, but here seemed no hope of any suitable site in the area. The old Parish Priest had mentioned that there was a field not far from the old church but on the other side of the road that would be ideal for a new parish church and a convent as well, but at the time it seemed an utterly impossible dream. By degrees several other people mentioned it to Mother Seraphine also, so she thought of trying to acquire even a small portion of it, asking a friend of the community to negotiate as if it were for himself. But the owner, a Quaker, refused to consider any offer, saying that his two sisters who lived with him wanted it for a pleasure garden. However, both these sisters now died with a year and Mother Seraphine tried again through the same friend. Once more he failed, so taking one last chance she approached the owner in the name of the community. But he absolutely refused and this time stated categorically that it was against his religious principles to give ground for any religious institute except of his own creed. Very soon after this he had to go into hospital for a slight operation, and most unexpectedly the poor man died! There three deaths occurred in less than two years – so not much imagination is needed to surmise the subject of conversation between the community and their priest friend at the College the next time he visited on the Bridge! But there was still another “obstacle” left. All the deceased Quaker’s property, including this field of seven acres, was to be sold by auction. Everyone thought that another Protestant gentleman would buy the field because he had been renting it form the original owner for his horses – but when the day came, everything was disposed of very quickly except this very field, without a single bid being made for it. When the papers published the fact that it was to be sold by private treaty, Fr. Arthur Murphy, the curate of Graiguecullen and very good friend of the community went immediately to Mr. Governey and alerted him to the situation. Once the latter understood that the Poor Clares thought that this was a very suitable location for a monastery, he immediately offered to buy the whole field and give them as much as they wanted. 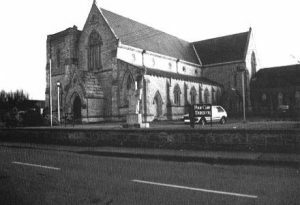 And not only that: he also offered the ground for a new parish Church attached, if ever the money could be collected to build one. Straight away he went to the auctioneer and since there was no other bid, the field was his. The curate’s joy was unbounded, but it was too late that evening to let the nuns know the wonderful news. Before he began the community Mass the following morning he asked the Sisters to unite with him in offering the Holy Sacrifice for their great benefactors, Mr and Mrs. Governey, who had just purchased the site for their new monastery and thereby secured the foundation in Griague. One can only imagine the feelings that welled up in all hearts and overflowed in grateful praise and thanks to the Father of Mercies and their most generous benefactors, who had given the two acres for monastery, garden and church rent free. “Ask, and it will be given to you; search, and you will find; knock, and the door will be opened to you”. (Matt. 7:7). Yet, indeed, Mother Seraphine knew in Whom she believed.